It usually doesn’t take much to convince me to travel somewhere, but I don’t think I’ve said yes to an overseas trip quicker than I did a few weeks ago when I was invited to Turkey. Some close friends of mine from Australia are doing a six month trip around the world and they decided to charter a yacht on the Turquoise Coast in Turkey and invite some of their closest friends to join them. What a splendid idea! I’d previously been invited along but had declined, so when some participants unfortunately had to cancel at the last minute, the invitation was extended again. Less than two weeks out from setting sail, I think I considered the offer seriously for only about 5 minutes before I started searching for the best flight. A few clicks later and I’d not only booked a flight to Istanbul, but I’d also arranged a connecting flight to Dalaman, my Turkish visa and accommodation in Istanbul. Before I knew it I was sitting on a yacht in Fethiye with a cold beer in hand, just waiting for my friends to come back from shore. The water was still, clear and ever so inviting. The last time I can remember wanting to jump into the ocean was over 3 years ago near Adam’s Bridge, I certainly haven’t seen an ocean in India that I’ve wanted to bathe in since then. But now there wasn’t much that could hold me back. My first time in the ocean in Turkey was near Kalkan, a town that’s been colonised by Pommie grey nomads. Needless to say we avoided it like the plague and just parked the boat in a quiet cove nearby. The water was clear and refreshing. Some turtles had the same idea, ducking their heads in and out of the water nearby. 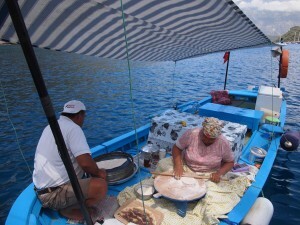 After a spectacular meal we docked at the nearby town of Kas and headed for dry land. Very much a tourist town, it still has some charm with its cobble-stoned streets and bougainvillea lined roadsides. Hidden amidst the imposing hills are Lycian rock-cut tombs and a ancient Greek amphitheatre that appears to still be in use today. Choosing to take the path less travelled, we traversed thorny bushes and overgrown dirt tracks to make it to the highest point in town which offered a spectacular view over to the marina. While I wish I’d worn more stable shoes than just my Havaianas, it was certainly worth the hike. Having worked up an appetite, we headed back to town to enjoy a traditional Turkish meal. Much to my chagrin that means meat and plenty of it, but thankfully the Turkish have also perfected the art of smoking eggplant and grilling calamari to perfection, so I was satiated. That evening we docked in a place called Smugglers Cove that is a secret haunt for those in the know. Tucked in a quiet corner there’s a clandestine pirate bar that comes alive at about 10pm. While some of our party decided that was just too late for them, a few of us headed by boat for a drink or 5. It wasn’t long before we were joined by about 15 Australian girls who were on a gap year, so to the tunes of the 80’s we danced the night away and drank the rather meagre bar dry. 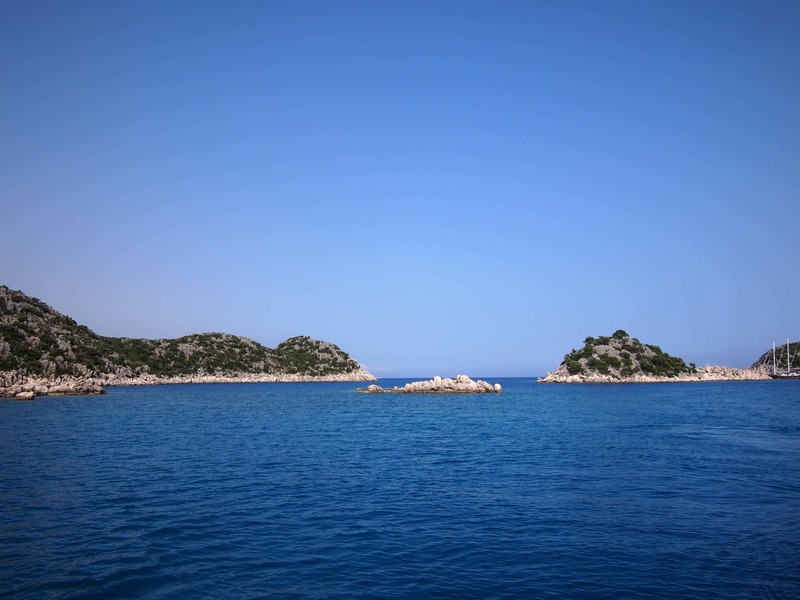 Our next stop was Kekova which is famous for it’s sunken Lycian ruins. As we sailed slowly past we could see the remnants of where buildings had fallen to the elements. Unfortunately tourists are no longer allowed to snorkel over the ruins, which limited our view of the area. Nearby we headed to land again to climb up to Kalekoy Castle. An imposing site from sea, up close it’s a crumbling ruin with little of the original structure remaining. However the view over the bay was well worth the effort. After a rather stormy night of travel we ended up in Butterfly Valley which was my favourite place. A quiet cove with the clearest water I’ve seen, I could see straight down 15 metres to the sandy bottom. The water itself was like a warm bath, we spent hours just enjoying the beauty here. On dry land we walked about a kilometre inland through a park that contains over 100 species of butterflies, although I’m sure I only saw about 5. At the end is a steep climb up to a waterfall. While my fear of heights prevented me from going the rest of the team went up for a look, including a 5 year old who put me (and my fear) to shame. 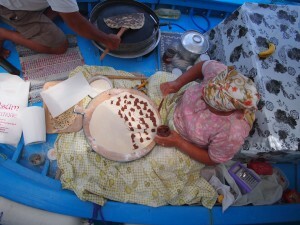 Just to prove that you can get almost anything on the sea in Turkey, we came across this boat of gozleme makers one day. 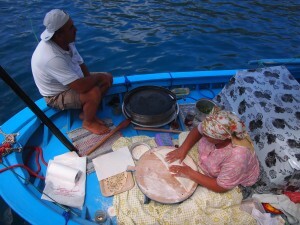 A gozleme is like a Turkish pizza, with flat bread rolled out and filled with whatever you’d like and then cooked on stove top. 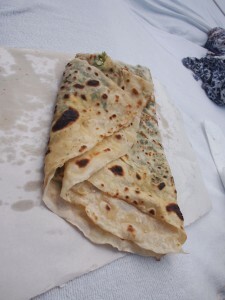 While nutella and honey were the order of the day, I settled on a fresh and salty spinach and feta gozleme that hit the spot after a very energetic morning of floating in the ocean. 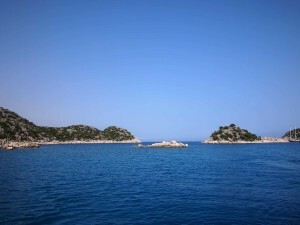 One of our last stops on dry land was at St Nicholas Island, also known as Gemiler Island. On the walk to the top of hill we passed several Byzantine ruins from ancient tombs to churches that had long since been abandoned. At the top there were views of the sapphire bay on both sides. It was quite beautiful, so much so it incited one of my friends to propose to his girlfriend. Of course she said yes! While there were celebrations on board, there was also a hint of sadness as our week long adventure was coming to an end. I for one was particularly sad to see this holiday end. While my backgammon skills had not improved at all despite the efforts of our captain, I had reconnected with some good friends, made some new ones, awakened my joy of bathing in the salty sea and seen one of the most sublime coastlines in the Mediterranean. So would I charter a yacht again? Absolutely, as a matter of fact Croatia is looking quite nice indeed. If you’d like to charter a yacht in Turkey you can check out V-Go Yachting who we went through. Please note I haven’t received any incentives for mentioning them, I just thought they did a great job. Thank you Rakhee for these kind words, we hope to see you again soon! Katia from V-GO Yachting, Fethiye, Turkey.